Securing the bug out tools you will need and the perfect bag are just a few steps in the quest for a bug out bag ready for SHTF. Where and how you pack your bug out bag can play a large factor in how effective your BOB actually is. Load distribution, accessibility, and even conceal-ability are important when considering your organization strategy. Don’t get caught with an uncomfortable pack, fumbling for the tool you need when time is short. Depending on your location and anticipated threats, your highest priority may be different. If your Bug Out Location (BOL) is a long ways away, weight distribution is almost surely your #1 priority. Urban areas may require resource accessibility or a gray man appearance to be the highest priority. You can even anticipate changing priorities. For instance, an urban prepper may initially pack for resource accessibility and then change the packing method for better weight distribution once they have left the urban center. Regardless of your intent, you will want to keep each of these priorities in mind when you pack your bug out bag. The most popular method, and a good fallback for any new prepper, is to pack with your bag weight distribution in mind. How much weight you can carry depends on your bag selection, body type, and fitness level. A very vague rule of thumb is that 25% of your body weight should be your bottom line max, yet this measure can overload you for long distances- especially if you weigh more. Pack weight is something that gets much harder to handle with every pound you add. The difference between 40-41 pounds can have a much different effect on your body than the difference between 20-21 pounds. This is further complicated by how you distribute the weight within and on your pack. A top heavy pack will require more muscle control stabilization, tiring you out even quicker. 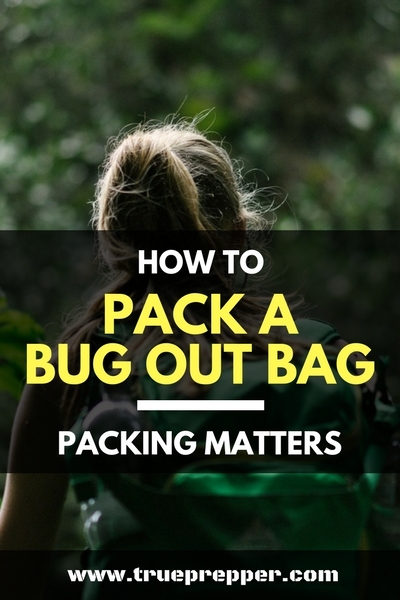 The backpacking community is a great resource for learning to properly pack a bag for the best weight distribution. There are many great video out there discussing this, and Marco Johnson does a great job here. With the various situation you could encounter, quick access to your equipment may make the difference between life and death. 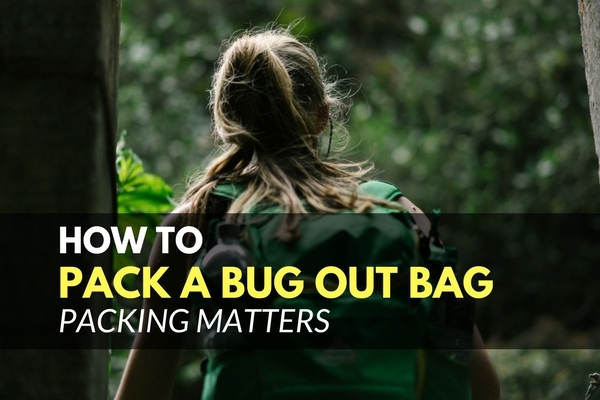 Tactical packs excel at having equipment within a moments reach, but other types of bug out bags may need some packing forethought here. Safety and security equipment are the highest priority equipment to have rapidly accessible, and on your body if possible. Other rapid accessibility considerations include common use versatile tools. A multitool, zip ties, and 550 paracord are all extremely versatile resources, but won’t do much good if they are lost in the bottom of your bag. Use external pockets, straps, and tethers wisely to keep important items within reach. After you concentrate on your rapid access equipment, think about the rest of your supplies and the best logical way to store them. Weight usually takes precedent here, as we mentioned above, with bulk food items, sleeping equipment, and cooking tools placed in the bottom of the bag and hardest to access. The Gray Man Concept is nothing new, but should be a consideration for anyone packing a bug out bag. Advertising that your bag has everything that anyone would need to survive can make you and your bag a target. Tactical bags struggle with this, since they are easily identified as packs that hold valuable supplies and equipment. Tactical bags usually have the ability to have a modular load out, which exposes your equipment and supplies. Packing these supplies inside of your bag may be the best course of action, depending on your situation. One quick workaround to get the best of both worlds is a rain fly for your bag. This subtly hides your bag and everything attached to it while still allowing the equipment to be somewhat accessible. It provides the obvious bonus of rain-proofing your supplies as well and then run fairly cheap. A simple rain fly can make a tactical bag less noticeable in urban areas, but give you fast access once the fly is removed. Once you have you bag packed and prepped, don’t forget to familiarize yourself with it. Hands-on familiarity is invaluable as far as knowing where things are and being able to access them quickly. Trying out your bag is important so you can know if you are pushing the weight limits and may need to leave out some equipment. Keep exploring, stay prepared, and be safe.